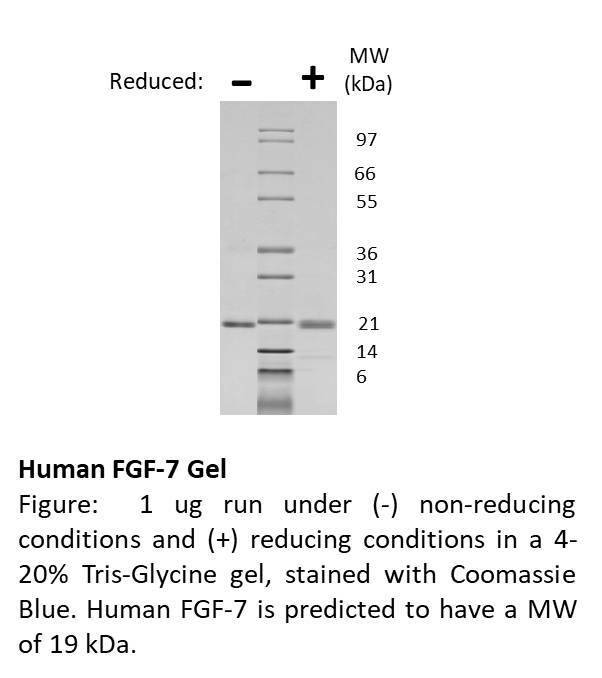 FGF7 / KGF Protein LS-G23584 is Recombinant Human FGF7 / KGF in E. coli It is biologically active and is low in endotoxin Less than 1.0 EU/µg protein (determined by LAL method)..
Fibroblast growth factor 7 (FGF7), also known as keratinocyte growth factor (KGF), is a potent mitogen that regulates epithelial cell migration and differentiation. 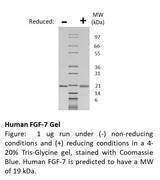 FGF7 is produced by mesenchymal cells and binds in high affinity to a splice variant of FGF receptor 2 (FGFR2-IIIb). The mitogenic activity of FGF7 acts predominantly on keratinocytes, but not on fibroblast or endothelial cells. FGF7 expression is upregulated after acute and chronic injury, suggesting that FGF7 functions during the healing of injured epithelial cells. FGF7 also induces the formation of the apical ectoderm ridge during limb development. This product is produced with no animal or human origin raw products. All processing and handling employs animal free equipment and animal free protocols. Tested using: 4MBr-5 cell proliferation. Less than or equal to 60 ng/mL and greater than or equal to 1.7 x 10^4 units/mg. Typical ED50 is less than 5 ng/mL. If a precipitate is observed, centrifuge the solution thoroughly and use only the soluble fraction (removing it from the precipitate). A 10% overfill has been added to compensate for any loss of protein in the precipitate.